It was the summer of 2012 at a Tattoo parlor in the lower east side of Manhattan. She flew in from Germany just months after discovering the band online, today she was engraving the bands lyrics deep into her skin. Man On Earth was established in the late 2000’s by singer / songwriter Steven Nathan. Soon after completing a number of demos in his home studio, Nathan caught the attention of 8x Grammy winning mixer/producer Ken Lewis (Kanye West, Fall Out Boy, Lenny Kravitz). The two teamed up over a period of time writing and recording material that would lay the foundation for all that was to come. By 2010 the bands reputation had already begun spreading. On the heels of being scored in an independent film, Man On Earth was rated one of NYC’s top live rock bands by the Deli Magazine, had a song featured on the NBC Winter Olympics broadcast, a national TV appearance on Fox’s Fearless Music, a mention in TIME Magazine, and won numerous contests and awards. Things really started to line up in Man On Earth’s favor. When FMQB declared the bands song ‘All We Want’ a “best bet pick”, then clear channel picked up the song for their nationally syndicated radio show, it became obvious the world is getting even closer to discovering what has been so steadily building behind the scenes. ‘All We Want’ also became a staple at all NHL Islanders home games. At the point Man On Earth entered the studio to record their first official album, 2011’s ‘Things They’d Never Believe‘, the line up had been established and officially included Steve Gregoire on guitars and Adam Root on Bass guitar. Together with producer Cooper Anderson (Kanye West, FUN) the band wrote and recorded their debut album and then recruited Angelo Modica as Man On Earth’s full time drummer. The efforts paid off. 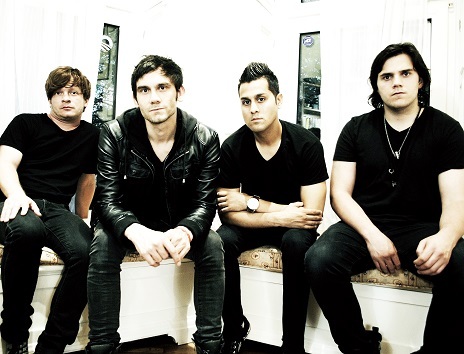 Immediately the band was opening for Simple Plan at their album release party in NYC and followed it up by touring with Hawthorne Heights, Madina Lake. Man On Earth also booked and promoted 5 successful national tours. In 2012 Man On Earth logged over 20,000 miles on the road playing close to 75 shows. With a strategy that includes a constant stream of new music videos, consistent touring and an unprecedented social network presence / fan interaction, Man On Earth’s introspective and positive message has been connecting with fans around the world on a deep and personal level. Harking back to an era when music was more than just the soundtrack to a reality show or video game… a time not too long ago when music was in fact a societal mirror as well as the catalyst directing popular culture – that is where the spirit of Man On Earth still remains surrounded by an ever growing army of dedicated followers. When Man On Earth returned to the studio in December of 2012 to begin recording their follow up to ‘Thing’s They’d Never Believe’, the band released a compilation of their early recordings titled ‘In Case You Haven’t Heard’. The digital only release requested by fans who had wanted to own the early recordings features guest appearances by pop icons Stephen Pearcy, lead singer of the multiplatinum 80’s arena rock band RATT, as well as keyboardist Dr. Fink of Prince & The Revolution. Much of what Man On Earth has achieved so far has been steeped in a deep DIY ethic coupled with an undying determination to connect with and inspire new and familiar minds. For Man On Earth, looking ahead to 2013, the goals are even bigger, the tours will be longer and further, and there is no doubt the impact will be even greater. Our attention is now drawn back to the lower east side with the sound of a buzzing tattoo gun where our new German friend is sitting. We watch the trail of dark blood dripping down her arm. As the rubber gloved artist wipes it away he reveals for us yet another letter… now we begin to believe. Man On Earth is in fact building a deep personal connection one soul at a time.